SESP junior Justine Kim speaks at an Associated Student Government Senate meeting. In her run for ASG president, Kim said she hopes to address the problem of prioritizing work over health. 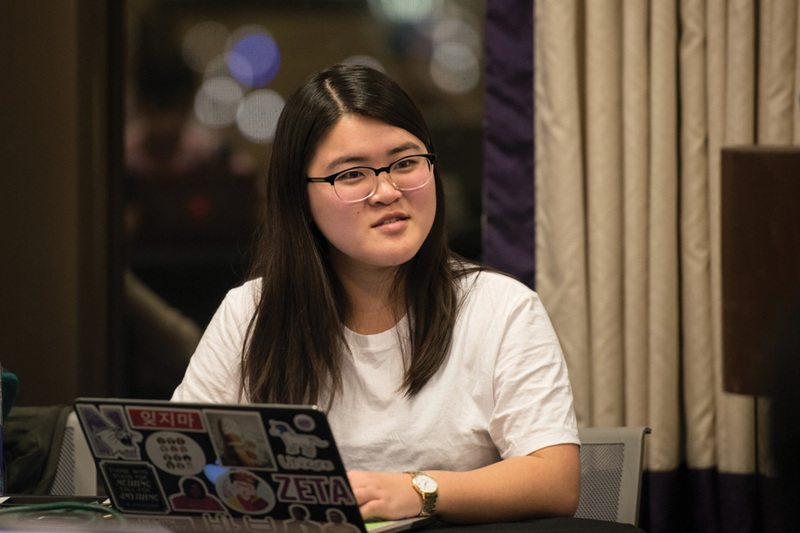 In her run for Associated Student Government president, Kim said she hopes to begin a cultural shift toward acknowledging that struggle. SESP sophomore Austin Gardner, Kim’s running mate, said the first step in making these changes is to stop “normalizing” work at the expense of wellbeing. Both Kim and Gardner said they’ve felt pressured to prioritize work over their health. Gardner said students are often forced to either break down, drop classes or quit extracurricular activities. He added he believes many professors don’t properly accommodate students overcoming illness. When campaign manager Izzy Dobbel suffered a concussion, she was expected to take three midterms without enough recovery time, she said. The SESP sophomore said she believes Kim and Gardner are “the best candidates for this position” due to their platform’s focus on wellbeing. In addition to health, their platform includes amplifying the voices of students with marginalized identities, improving accessibility for these students and reforming student group funding, Kim said. Kim said agency and equity will be at the core of the campaign, as not all students have the same agency in maintaining their health or advocating for their interests. Gardner said he hopes to apply the same principles and ideas he pursued as ASG’s vice president for accessibility and inclusion. He joined the accessibility and inclusion committee after he experienced microaggressions and didn’t feel comfortable in certain spaces, but was “heartened” by the passion and dialogue within the committee, he said. Kim and Gardner will face Weinberg juniors Sky Patterson and Emily Ash in three debates prior to the April 12 election.